Asked about her GUSA policy team, Macky Grimm (COL ’21) hesitated. “I don’t really have one,” she said. When pressed, she admitted, “It’s just me.” Grimm, the chair of GUSA’s LGBTQ+ advocacy team, has spent the past several months working with students and administrators, proposing university policy changes, and conducting research—and she’s done it alone. Grimm’s story is unusual in the amount of responsibility she has taken on by herself, but she is not alone in driving change as a GUSA policy chair. The GUSA executive has 29 advocacy teams in total, each under one of four umbrellas: student affairs, campus life, student inclusion and advocacy, and university affairs. These students are not elected officials, but they devote their free time and energy to working within the GUSA and university bureaucracies. Now, as a new GUSA administration takes the reins and forms new teams, outgoing policy chairs have a chance to reflect on their work. 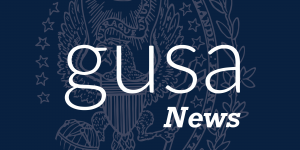 Policy teams were first created in 2016 by GUSA President Enushe Khan (MSB ’17) and Vice President Chris Fisk (COL ’17) to combine two tenets of the previous system: under-secretaries in the executive branch and senate committees. The new structure was intended to help the executive get more students involved in policy advocacy and facilitate better relationships with the GUSA Senate. Khan and Fisk ran on a platform of making GUSA more inclusive of all students. “I think that restructuring to allow more students who are passionate about certain issues to take part in driving policy is one of the first ways to do it,” said Fisk in an 2016 interview with the Voice. Policy chairs apply for their positions at the beginning of each administration and are confirmed by the senate. Each chair oversees a team and collaborates with senate liaisons to improve campus in ways related to their policy area. Last year, the senate restructured its committees to give each policy team a dedicated senator to work with the executive-nominated chair. Grimm applied to fill the LGBTQ+ team’s chair position to encourage Georgetown to support its LGBTQ students. “It can be pretty intimidating [for LGBTQ students] coming to a Catholic school,” she said. The university does not require any diversity training around treatment of gender and sexuality for students or faculty, and Grimm said that policies on the allowed gender of roommates for transgender and non-binary students are unclear. One of Grimm’s biggest projects is encouraging professors to ask students to specify which pronouns they use alongside their names while calling roll on the first day of class. Grimm said this change would be easy to implement and help transgender and non-binary students feel more welcome in class. The idea has received support from faculty and staff and is similar to policies at other universities but has not received support from the administration, Grimm said. Grimm has tried to initiate a broader movement toward using more inclusive language on syllabi and in classes. A policy encouraging inclusive language passed the Faculty Senate but did not include information about how it planned to move forward. While Grimm was encouraged by the changes made in some of her classes, the university does not yet have a comprehensive policy. Gabby Brault (SFS ’21) said she was never before drawn to working in student government, but she saw the value in having policy teams to advocate for underrepresented students on campus and decided to apply. It is crucial that policy and advocacy teams include people who represent the issues they work on, Brault said. She has used her own experiences as a low-income student during her tenure as the Socioeconomic Policy Chair. “I hate it, I absolutely despise it, when there are people who aren’t representative of the community in a policy area,” she said. “The idea was to reduce waste on campus by having Hoyas support other Hoyas,” she said. During the drive, students donated more than 200 notebooks, folders, and other items. Brault ended up having to buy supplemental items because all of the donations were taken on the first day of distribution. The speed at which the donations were taken was exciting for Brault but also showed that there is a clear need for more programs like this. She is planning a similar collection at the end of the semester and hopes to work with Residential Living to collect dorm supplies as well. Brault was also hoping to learn more about the university’s policy of displacing university-given financial aid with outside scholarships, but she said she struggled to get information from Georgetown administrators. “I would email specific people, the financial aid office, the office of strategic communication, and just never get any response,” she said. She said that without information from the university, it was nearly impossible for her to move forward. A lack of information can stymie projects for many policy teams, Brault said. In her experience, policy chairs often have to communicate to relevant administrators through the GUSA executives and rarely get to sit in on meetings with administrators or directly consult university officials. While administrators mean well, Nkechi Nwokorie (NHS ’20), chair of the Racial and Cultural Inclusivity Committee, said she feels they often need student guidance to join the conversation. Nwokorie had only been the head of the committee for a few months, but her previous experience as a member of the team helped inform her perception of the administration. “Administrators want to have these channels of communication open, they want to be able to engage with students, but they feel as though they don’t know when to step in and when they’re overstepping,” she said. Nwokorie’s policy suggestions have been largely shaped by interactions between students and university officials. A town hall hosted by her team in December 2018 began conversations between students and administrators around race and culture at Georgetown that she would like to continue. “Our main goal is to be a liaison between the administration and the students on campus,” she said. Nwokorie perceives a disconnect between the students and the administration when it comes to university policies and potential policy changes. Nwokorie is confident she can use the knowledge she has already gained to set a policy agenda while continuing to learn from administration. To this end, Nwokorie has developed a list of potential policies for the team to work on. One example is a proposal for a blind grading system. Nwokorie believes this system is important to avoid implicit racial bias in grading. But the most important of the policies, she said, is a racial climate survey, similar to the sexual assault climate survey students filled out in March. The Office of the Provost has already begun drafting the survey, and Nwokorie is working with them to ensure the survey receives answers her team can use to move forward. Grimm, however, has felt the university has limited the amount of policy change she has been able to pursue. She said has struggled working with administrators who offered support in meetings but did little to change their public policies. “It’s frustrating that they say they’re doing all they can, but I can’t even get a clear perspective on what that is,” she said. In the fall, Grimm asked administrators to discuss implementing languages changes and was directed to the resource page for LGBTQ students rather than being offered a meeting. The university also does not make its policies clear on many issues that are important to LGBTQ students, Grimm said, such as name changes and restroom accessibility. She worries the lack of transparency on these issues could dissuade potential Georgetown students from applying. Grimm believes the university neglects LGBTQ issues more than other policy areas and that the university has been slow to accommodate LGBTQ students. She said the only problem she has faced with administrators is that they do not always have the authority to grant her requests, which can slow down policy changes. As the mental health policy chair, Alemayehu has worked with the administration and students on the mental health stipend, which allows students to seek therapy and mental health services off campus for free. Her other projects include working toward a Counseling and Psychiatric Services (CAPS) ambassador program to help increase knowledge on campus about the services CAPS provides. Nwokorie plans to continue building relationships between university officials and students. Before the town hall last semester, she said some administrators felt uneasy about how the discussion would go. “They didn’t know whether they were going to get yelled at or how the students would feel toward them,” she said. “Especially administrators who don’t come from specific marginalized identities or are in a place of privilege.” But after the event, she said more administrators began to understand the need for reform. Despite holding different opinions on the university administration, these four policy chairs appreciated former President and Vice President Juan Martinez (SFS ’20) and Kenna Chick (SFS ’20) for communicating with the administration and helping to implement policy. Nwokorie felt that Martinez and Chick were especially adept at supporting members of marginalized identity groups. “When I was in that room with them, I felt heard and supported,” she said. For proposals that were not adopted, Alemayehu said it was mainly a matter of limited time. “It sometimes felt like there wasn’t enough time to finish a project because we had a smaller term,” she said. “I think that unfortunately, it limited the amount of things they were able to accomplish.” Martinez and Chick took office in September 2018 after the previous GUSA executives suddenly resigned, making their term much shorter than most. 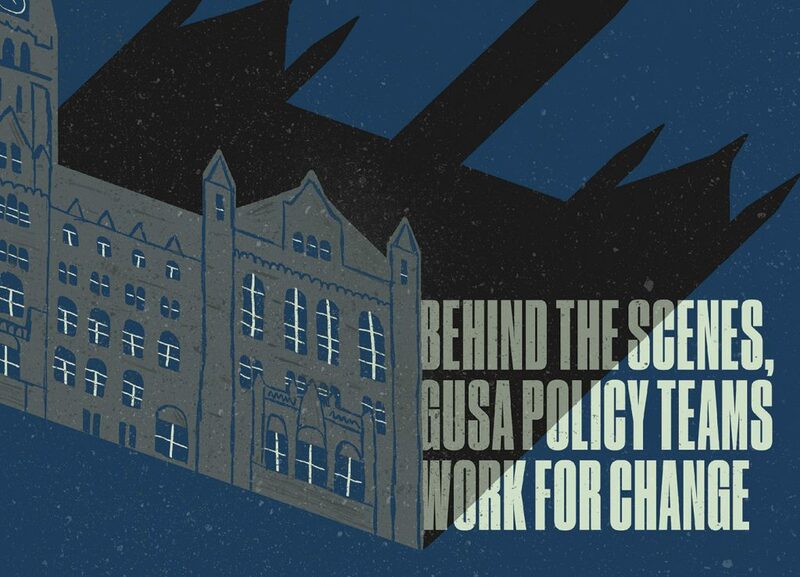 Another challenge for several policy chairs is that students outside GUSA are often not aware of the work they do. For Alemayehu, one cause of this lack of knowledge is how specific the projects are. “In all reality, several of the projects we have worked on might only impact certain members of the community, so the general student body may have to seek a specific service to see new policies in place,” she wrote. Brault feels that one solution is having GUSA collaborate with more established university departments, such as the Center for Multicultural Equity and Access and the Center for Social Justice. “No one knows what happens in GUSA because no one thinks to advertise it with departments that are related to the work,” she said. More policy chairs and advocates should share their work with the broader university community, Nwokorie said, but she thinks it is ultimately GUSA’s job to publicize the projects. “A lot of the time people in these positions don’t think of saying ‘I did this’ for recognition, but that undervalues the importance of communicating with the people you’re trying to work for,” she said. All four plan to continue to be involved, one way or another, under the new GUSA administration. Nwokorie hopes to continue on her team, and Alemayehu wants to work on a new, external board on student health. Grimm is also applying to continue as chair, with a focus on D.C. restroom policy and restroom accessibility for transgender and non-binary students. GUSA President Norman Francis Jr. (COL ’20) and Vice President Aleida Olvera (COL ’20) are currently recruiting new policy chairs. While they see the role of policy teams being similar in their administration, they do hope to improve outreach. “Our administration hopes to bolster the roles of policy teams by making their work more open to the public through better newsletter coverage and potentially more events like open halls,” Olvera wrote in an email to the Voice.